Vesica Pisces is a hybrid virtual reality and multi-channel projected video installation that exists as a speculative glimpse into an inter-dimensional state where the viewer-participant enters a world nested within a world within a world. The term, Vesica Pisces refers to a symbol made from two circles of the same radius, intersecting in such a way that the center of each circle rests on the circumference of the other. 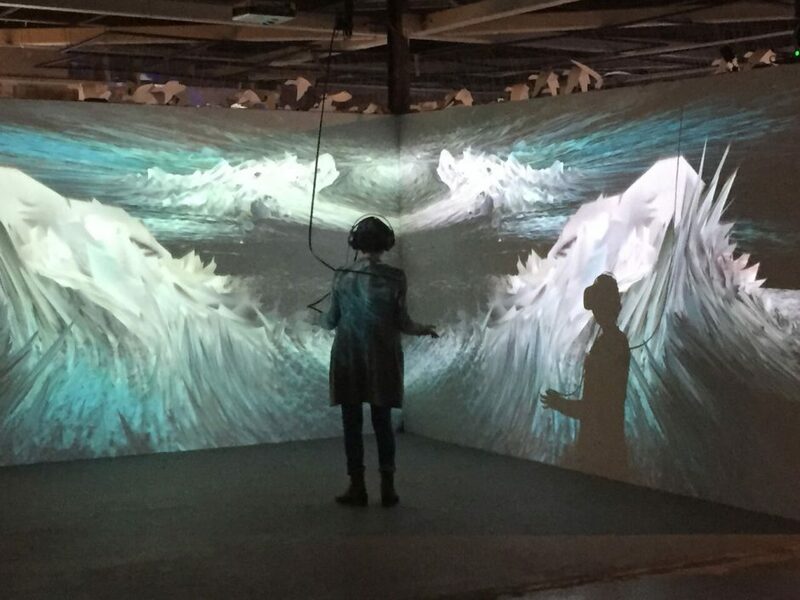 The artist team of Donovan, Metcalf and Stout utilize generative techniques in realtime algorithmic image, sound and music synthesis to create a tangible experience of traversing liminal boundaries. This reexamination of landscape explores the classical figure ground relationship within a simulated artificially intelligent virtual environment that allows for powerfully visceral experiences including extreme fluctuations of scale revealing seemingly infinite heights and horizontal expanses. This vast scale is contrasted by moments of intimate interaction with impossibly small objects that are able to retract into, or emerge out of, a single point within the apparent fabric of reality. In this medium, the VR headset and trackers are the devices that probe, prod or drive the properties of the simulation. Vesica Pisces reimagines this notion of control to provide a radical departure from the well worn ͞first person shooter͟ approach to game design. In Vesica Pisces the viewer-participant becomes an integral part of the aesthetic ecosystem, which enables a receptive freedom for each observer to wander and thus co-create a unique sonic-visual-somatic experience much like a visitor entering an extraterrestrial or inter-dimensional domain of ambiguous scale and dimension. The algorithmic forms suggest geologic, architectonic and biomorphic structures that appear to have their own sentient response to the viewer. The system unfolds or evolves as the viewers walk, wander and contemplate their place within a place that exists in a perpetual state of becoming.